You may have noticed that my posts aren’t very challenge-like lately. I’ll admit, I haven’t worked as hard on this one as I did for the sugar free challenge. I think the rules this time around are too lax. Organic chips are still chips after all. All I really have to do is have a smoothie and go for a walk. How hard is that? I need a challenge that is actually challenging. But I’m trying to shape up a little, starting with this post. The April 2010 issue of Chatelaine has a recipe for a Classic Tomato Chèvre Tart that really caught my eye. I’ve decided to make it challenge friendly by making the crust out of whole wheat flour and eliminating the sugar. I could have gone the extra mile and substituted the milk for something non dairy, but that seemed like overkill (and to be honest could have been disastrous). 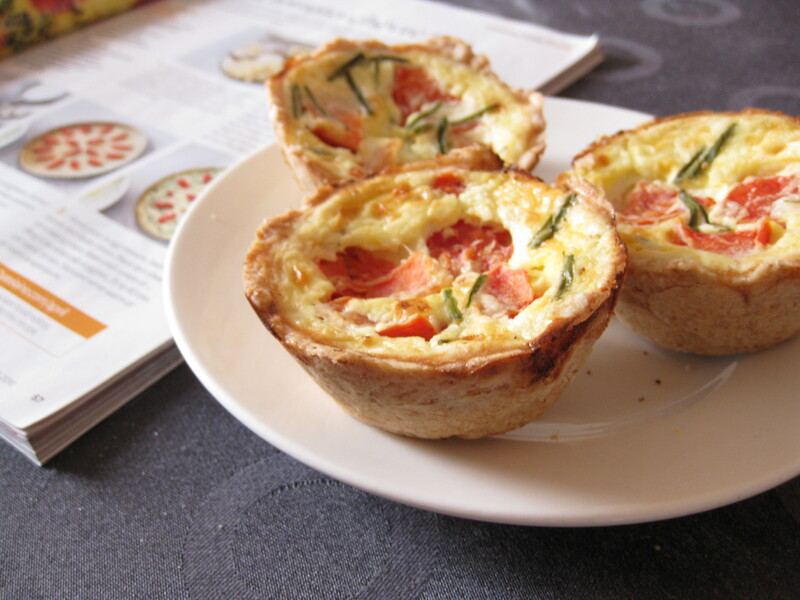 I also decided to make the tarts mini for easy office-lunch portability and for the cuteness factor. These smelled soooo good in the oven. I could hardly wait to have a bite. And when I did have a bite, it was like a little bit of goat cheese heaven. Bonus, this recipe is really easy to make, it took me just a few minutes to get the dough and the filling together. I’ll be submitting this post to Cream Puffs in Venice for Magazine Mondays. Be sure to check her blog to see what all the other Magazine Monday-ers are up to! In a large bowl, combine flours, butter and salt with your hands until a it takes on a crumbly texture. (This can be done in a food processor too). Add liquids and stir till ingredients for a ball. Press dough into a muffin tin. Refrigerate for 20 minutes. Combine eggs, milk, cheese , chives and salt and pepper in a bowl. Put some diced tomato in each muffin cup. Pour 1/3 cup of egg mixture into each muffin cup. Bake for 25 to 35 minutes, until filling is set. Those are spectacular! They look very sophisticated … perfect for a party. Well done! I got 10 from the recipe. Pingback: Cream Puffs In Venice - Magazine Mondays: More Rhubarb! Those are challenging….and I would love to eat them,. Love me some goat cheese!